Why settle for static, unchanging displays? With Donnellon McCarthy Enterprises’ (DME) stock of innovative digital signage solutions, you can create interactive content that converts passive viewers into active participants. Virtuoso is a custom-designed solution that delivers engaging and interactive customer experiences by the power of touch. This interactive solution is completely unique to every client application. 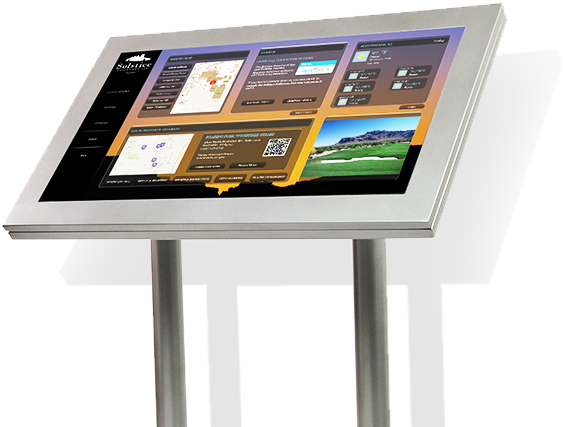 It presents content in a compelling environment to promote your products and services and can also provide effective self-service experiences with a touch display. Its exceptional functionality takes users from passive to active, allowing them to explore, expand and mark up content, watch videos, play games and access information. Whichever Virtuoso product you choose, you’ll have the power to create everything from simple map displays to step-by-step directions that users can upload onto their mobile devices. If you need assistance creating content for your signage, Toshiba’s experts can help. Their staff of content specialists will work with you to develop applications that achieve your goals. Content that updates automatically according to time, products in stock and other triggers. Want to learn more about Toshiba Virtuoso Digital Signage? Contact us today!